The Slovenian company EK Water Block announced the early start of sales of full-coverage Water blocks for the “family” of AMD Radeon Vega GPUs. New Waterblocks for Vega would be called EK-FC Radeon Vega, it removes heat from the GPU / HBM2 memory, and compatible with the reference models of Radeon Vega Frontier Edition, Radeon RX Vega 64 and Radeon RX Vega 56 graphics cards. 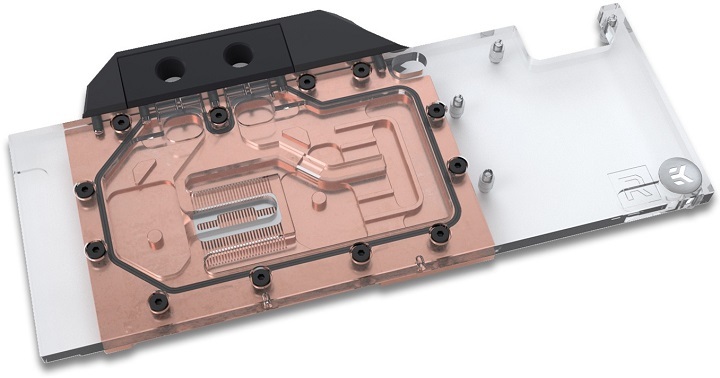 The base of the Water block is made of copper and optionally covered with a thin layer of nickel. For more efficient heat dissipation from the GPU, there is an array of Microplates on the inside. The cover of the water block is available in black Acetal and transparent acrylic. Water blocks of the EK-FC Radeon Vega family are compatible with G1 / 4 fittings, and their complete set includes all necessary fasteners, thermal spacers and EK-TIM Ectotherm thermal grease. In addition, EKWB will also offer black and nickel reinforced plates, estimated by the manufacturer at € 24.5 and € 31, respectively. EK-FC Radeon Vega water blocks are already available for pre-order in the official online store of EKWB, their delivery will begin on August 14.